(07-01-2017, 11:42 AM)Scott C. Wrote: I have not tried the exercises with the mask yet. What is the best way to do that as far as the machine recording it? Should I take out the SD card then practice? I wouldn't bother with taking the SD card out. As soon as you stick it back in the machine, all the data except the flow rate will be recorded onto the SD card. Seriously, don't worry about the "daytime use of the machine" contaminating your data in some way. You'll know when you were using the machine in the daytime and you can just (mentally) adjust the numbers and/or turn off the individual sessions inside SH, even though they'll still show up in Encore if your sleep doc ever looks at the data. Besides: Looking at that data where you are practicing your exercises in SH will give you a much better idea of what your wake breathing looks like. You'll also develop a sense of just how often the machine scores OAs, Hs, and CAs when you are wide awake and concentrating on something. All of that can be useful in learning how to pick out a possible wake/arousal in your overnight data. It will also help you learn how to use the flow rate data to tell when you make the switch to sleep at night. Quote: Here is last nights chart same settings. mouth taped and cervical collar. Bottom line on the pressure graph is A-Flex in action: A-Flex reduces the pressure by a variable amount on each exhalation. The actual amount the pressure is reduced depends on both the A-Flex setting AND the strength of the exhalation. The data on your machine is not recorded with enough granularity to see how A-Flex is implemented on each and every exhalation, but because most exhalations strongly resemble their neighbors in terms of "strength of exhalation", SleepyHead can use the data that is recorded to draw a decent EPAP graph based on the A-Flex data. With your current A-Flex settings, on this night most of the time A-Flex gave you a bit more than 1.5cm of exhalation relief---i.e. A-Flex was dropping your pressure by about 1.5cm at the start of (most) of your exhalations. On a few exhalations, A-Flex dropped the pressure a bit more--it looks like on your most forceful exhalations, A-Flex dropped the pressure by about 1.75cm. (07-02-2017, 02:30 PM)Scott C. Wrote: O.K. here is last nights chart Same settings no changes believe it or not. 3 days running Plus cervical collar and mouth tape. Please post what you think and if I'm heading in the right direction. How many wakes are you remembering these days? And how are you feeling during the daytime? Certainly the AHI data looks good. Leak data is quite acceptable. So in terms of objective data, you are definitely heading in the right direction, and you could argue that you've reached the destination of "highly effective CPAP therapy." 1) Are you getting to sleep in a timely fashion? 2) Are the number of middle of night wakes that you remember low enough to not be a problem? 3) Are you getting back to sleep quickly when you do wake up? 4) How rested do you feel when you get up in the morning? 5) Has there been any improvement in terms of how you feel during the daytime? Quote: Are the pressure pulses normal? 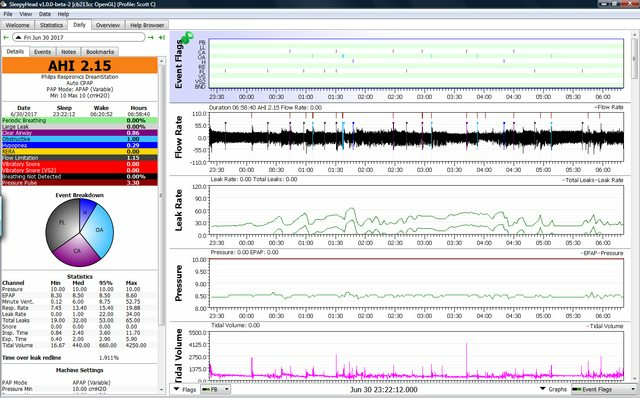 The pressure pulses (PPs) are how the DreamStation determines whether your airway is clear or obstructed. Note that the Dreamstation sends out a PP whenever the flow rate has dropped substantially for about 6 seconds or so---i.e. you can see a PP in flat part of the flow rate that is not long enough to be considered an apnea. In some events, the machine may send out 2 or 3 PPs. I'm not sure why. My guess is that it either is programed to send out a PP every few seconds during the apnea OR perhaps it sends out a second (or third) PP if the results from the first one are not conclusive in terms of determining whether the airway is clear or obstructed. 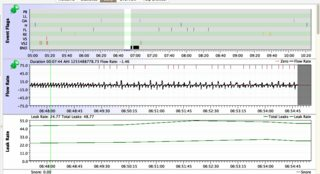 Finally, the DreamStation also sends out (lots) of PPs if it is having trouble tracking the breathing. In other words, when the leak rate is higher than normal, you sometimes see strings of PPs that the machine is using to try to determine whether there's a living, breathing human being attached to the other end of the hose or not. (07-02-2017, 04:48 PM)Scott C. Wrote: Thanks "opalrose" Still learning how to read chart. What does the Flow limit graph mean? How important is it? Resmed machines and PR machines record Flow Limitation data in very different ways. Resmed machines record a "Flow limitation graph" but PR machines record "Flow Limitation Events" with tick marks that show up on the FL line of the Event table and as tick marks in the Flow Rate data. Since you are using a DreamStation, you do not have a Flow Limitation Graph. Your Flow Limitation Index (FLI) is very low and the number of tick marks on the FL line of the Events table are far apart. In other words, you don't need to worry about Flow Limitations as being a significant problem right now. (07-03-2017, 10:45 AM)Scott C. Wrote: "opalrose" Does the flow rate cause the pulses too? No. In general the Dreamstation does not send out a PP in response to a FL. 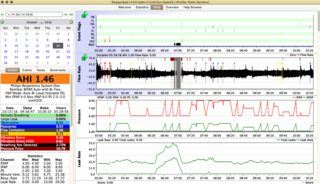 PP are used to determine whether the airway is clear or obstructed when the machine thinks it may need to score an apnea. PP are also used to determine what's going on in the presence of a leak that is both high enough and long enough to make the machine worried about whether it is tracking the breathing correctly. PP can also be used if the machine is having trouble tracking the breathing even if there is little or no leaking going on. If my mask slips in just the "wrong" way, the seal is somehow maintained, but the airflow that my machine can record drops substantially for many minutes at a time. And I'll see lots of PPs during that period. If things get "bad enough" the machine loses track of my breathing altogether in something my DME derisively and inaccurately calls a "patient disconnect." I don't get them often, but I'll see if I can post one for you to see what I mean. Quote: Sleepyhead says I had major air leak last night see my c-pap advisor. So here is last nights graph. Yep. That looks like "mouth breathing". Or more correctly, mouth leaking since you're taping. How much to worry about it? Well it depends. If you see a leak like this every now and then and you're feeling fine (in general) and the rest of the data looks good, it's not worth worry about. If you see leaks that are this long and this large frequently (several times a week) AND if you feel pretty lousy the next day every time one of them happens, then it's worth trying to figure out if there's a way of reducing them. Quote: same settings for last 4 nights. I would continue running with those same settings. Changing the settings is not likely to fix the leak problem, and it creates yet another variable to deal with. Your current settings are giving you good numbers in terms of AHI, snoring, FL AND most of the time your leaks are reasonably under control. Quote: A couple observations Found out I can still exhale through microfiber tape which I think would explain the major leak and dry mouth. You are not going to be able to prevent all instances of air leaking out through your mouth through taping. Your leaks are not great, but they are acceptable, even with an occasional night like this. Switching to a FFM may fix the leaks. Or not: When your face relaxes during deep sleep, maintaining a seal on a FFM is can be more difficult than maintaining a seal on a nasal pillows or a nasal mask since the foot print is so much larger. In other words, opening your mouth in a FFM due to jaw relaxation can break the seal even if your mouth is under the mask. Moreover, switching to a FFM is not likely to fix the dry mouth problem. The dry mouth problem is caused by air entering (and blowing around) your oral cavity. Using a FFM does not prevent that: A FFM only prevents that air moving in your oral cavity from contributing to the excess leak. Quote: But also seem to be swallowing air via the burping and passing gas. As someone posted on this thread could happen. Should I be concerned? If your tongue does not prevent air from entering your oral cavity, then that excess air in your mouth has to go somewhere. If your lips crack open even a tiny bit, the air will (mostly) escape in a hiss of a mouth leak. It could show up in the data as a small leak or a large one, depending on how much air is leaking out of your mouth, which can depend on how wide you open your mouth. If your lips stay firmly closed so no air escapes that way, the air still has to go somewhere. And the only other way of getting the excess air out of your mouth is to swallow it. Which leads to the burping and passing gas. The "air in the stomach" problem is called aerophagia around here. Should you worry about the aerophagia? Like so many other things with CPAP therapy, the answer is: It depends. In general: If you are bothered by the extra burping and farting AND you're not in any pain from getting the air in your stomach, then it's fine to just ignore it. But if you are experiencing pain from the air trapped in your stomach or if it's waking you up at night, then the aerophagia is a huge issue. If you're between the two extremes, it's a matter of figuring out how bothersome it is for you. In my case, aerophagia is and has been one of my most significant CPAP related issues right from the start. A large part of my CPAP-induced insomnia stemmed from the fact that I get physically very uncomfortable once even a small amount of air winds up in my stomach. And I've woken up with my stomach visibly distended from the air trapped inside and doubled over in pain. Aerophagia at low pressure is, in fact, what was used to justify switching me to a bi-level machine after I spent 4 months in agony trying to adjust to CPAP back in 2010. But most people don't get the kind of severe aerophagia that I experience. My husband is happy to fart and burp it all out when he gets a bit of air trapped in his stomach and so he doesn't have to worry at all about it. How are you feeling in the morning? And do you have enough energy to get through the day? How are you sleeping at night? Still having night time wakes? If so, how many? The data is all from October 14, 2016. 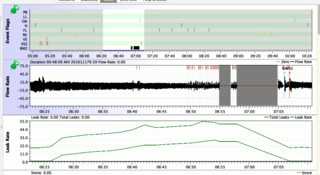 It's the last time that I've seen this particular phenomenon in my own data. I typically see a few incidents every year, but because they're rare, I don't worry about them. On the night in question, I probably did have some serious mouth breathing going on. That is NOT typical of me. The think to note here is that this leak was bad enough where the machine gave up trying to track my breathing: The break in the flow rate is NOT caused by me turning the machine off and on and I know that since the leak data (and the pressure data which is not shown and not interesting) do NOT have the same breaks in them. So the machine was on, but it could not detect any breathing. Now I'm not dead, so we can assume I was breathing during the 2 and 6 minute periods of "Breathing Not Detected", although it is quite possible I was not breathing well during those periods. We just don't have much data about how well I was breathing because the machine was not accurately tracking my breathing. It starts with inhalations that look normal (in shape) but slightly smaller than normal (in size). As the leak starts to grow, the breathing does get more irregular. It could be that I've hit REM sleep. It could be the leaks are just preventing the machine from accurately tracking my breathing. Heck it could be I've turned on my back. We just don't know. So it's possible that there are a series of unflagged Hs here, but given the running baseline for the breathing, there's no accurate way to determine if the airflow has dropped enough (50% from the running baseline) for 10 seconds or more to score an H.
But also notice that throughout the sequence, the machine is sending out PPs in an effort to figure out what's going on. It knows there's a large leak. And it knows that my baseline flow rate data has dropped pretty low, but the drop was not quick (the way it is in an H), nor was it short lived (like it usually is in an H), and in the presence of that leak the machine knows the data is ratty. "robysue" Welcome back! Thank you for taking the time to respond to my thread. You have given me a lot to digest and think about . Including "how do I do multiple quotes?" L.O.L. Mornings I still feel tired. No aha moments. But I do have enough energy to get through the day and maybe not so tired as the day goes on. Still waking up about 5 times during the night ( mostly dry mouth last night) But staying in bed till morning for the most part. Used to get up 2-3 times to go to bathroom. So there is an improvement. The "aerophagia" doesn't bother me much. And I figure that is a tongue thing and would not be relieved by a FFM. As far as comfort goes. Getting used to tape and the collar, but as you see from past charts not sure they are helping with sleep. The long large leak was new to me. So hopefully it was a fluke. Been try to sleep more on my side so that might cause mask to slip. You could use BB code, the multiple quote thing doesn't seem to work. I put this in a code box to display it. If you don't it will display as below. Will look like this when you post it. Scott did not write this. StottC. Wrote: Will look like this when you post it. Scott did not write this. Did I mess with something? When I hit the "reply" or "reply with quote". I get a box with mixed up quotes. I get the most recent post with an older post. ? (07-03-2017, 03:54 PM)Scott C. Wrote: Did I mess with something? When I hit the "reply" or "reply with quote". I get a box with mixed up quotes. I get the most recent post with an older post. ? A while back the forum went to a WYSIWYG editor that "hides" the BBCode stuff that makes the quotes appear correctly. I've not been able to figure out the WYSIWYG editor for more than a simple "quote the whole thing and respond under the quote" post. However, it is easy to switch to a text based BBCode editor that shows the BBCode. Then you can put the "quote" stuff at the beginning and ending of each quote and easily do multiple layers of quoting. 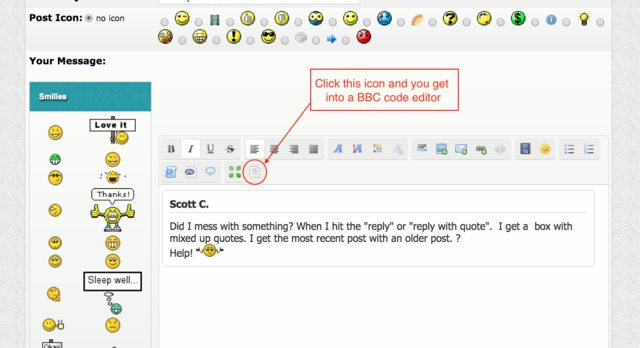 Here's how to get into the BBCode editor rather than the WYSIWYG editor. 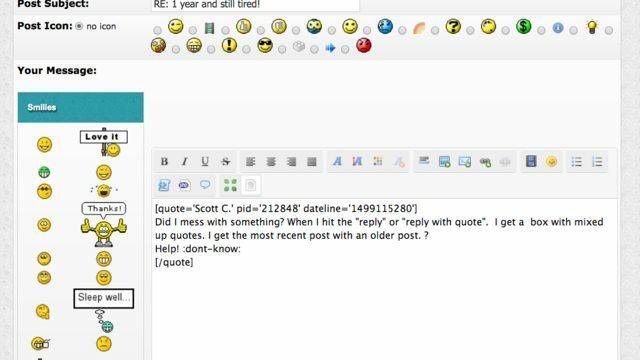 First screen shot shows the standard WYSWYG editor with the embedded (quoted) post in it. Note the little icon that I've circled in the screen shot. It's alway at the end of the list of icons when you start a post with "Reply with Quote"
Once you are in the BBCode editor, put [ ] around the word quote where you want the quote to start, and put [ ] around the word /quote where you want the quote to end. To quote more than one post, use the "Quote Multiple Posts" button on each post you want to quote. If you then hit the New Reply button, you'll be in the WYSIWYG editor with room to put your comments between posts. You can also hit the Quote these posts now link in the "Quick Reply" window at the bottom of the thread and you'll be dumped into the BBCode editor with the posts all lined up with the [ quote ] and [ /quote ] stuff in place. In either case, the posts are listed in chronological order.